Also Recommended: Hello Kitty, anything on Nick Jr.
Notes: Based on a series of children's books by Kawai Ritsuko. Gosho Aoyama, best known for creating Case Closed (Detective Conan), did the human character designs in the series. Hamtaro is a fun-loving hamster who is a pet of a 10 year-old girl named Laura Haruna. What his owner doesn't know, though, is that when she leaves Hamtaro to himself, he's with his hamster friends from around the neighborhood. They call themselves the "Ham-Hams", speaking their own Hamster language and meeting in their own clubhouse (the "Ham-Ham Clubhouse"). 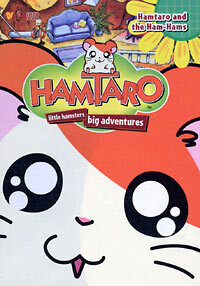 The series revolves around the misadventures of Hamtaro and his friends. It's really hard to comment on a series like this (being stating the obvious statement that this series is very cute). After all, you don't get more kid friendly, or cutesy, in the realm of Japanese television animation than having cute little hamsters running around having fun for 22 minutes. And yet I, a 20 year-old guy, who enjoys anime for teenagers like Cowboy Bebop, am able to tolerate the cuteness of this series. Why? Because it's too cute, and too charming, for me not to like it. The personalities for the hamsters aren't anything special, but they're passable for a children's show : there's a brainy hamster, strong hamster, sleepy hamster, twin hamsters, a cleaning freak hamster, and the courageous Hamtaro himself among others. Oddly enough, the hamsters seem to have more personality than their owners do most of the time. Laura (Hamtaro's owner), for example, is just a regular ten year-old girl with a brainy best friend, and has the hots for a boy in her class: Travis (who has some of the corniest dialogue in the English dub, by the way). Much like Emily Elizabeth's role in the Clifford and the Big Red Dog books, and Mickey Mouse's role in the late 40s/early 50s Pluto cartoons, the only thing you really need to know about Laura is that she's Hamtaro's owner, and little much else. Sometimes a story will have a sub-plot involving her, but not often: the main focus is on Hamtaro and his hamster friends. Thankfully, as a kids' show, most children won't recognize the poor art and animation in the series. Backgrounds, repeated frames, recycled scenes (such as Laura saying good night to Hamtaro at the end of each episode), and the lazy tactic of "let's draw the hamsters from a perspective that won't involve us having to actually animate their mouths" are used commonly. Also, the hamsters don't look like hamsters more than multi-colored rubber balls: the pinnacle of art this show ain't. The writing isn't quite stellar, either, but it does cover a wide variety of customs most other children's shows in America won't talk about, such as the Japanese holiday like Kid's Day. The dialogue and voice acting is what you'd expect for a children's show, although I like to think that Ocean Group did a good job with the voice acting in this series. If your main anime watches revolve around action-oriented shows like Naruto, this is not the anime for you. However, if you have little children, cousins, siblings, or nieces/nephews, they might find Hamtaro to be entertaining. Besides, what would you rather have little kids watch: yet another anime brought to America to sell cards and toys, or one about a bunch of fun-loving hamsters who, even in the English dub, aren't shy to teach your children about customs and ideas both American and Japanese? I know I'd vote for the latter. Recommended Audience: Acceptable for all ages. If you can find anything objectionable about this series, I'd like to know. This could easily be on Playhouse Disney or Nick Jr., had those networks ever picked it up.